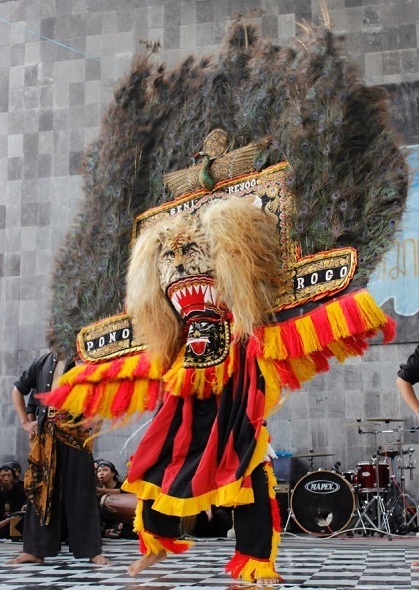 Reog Ponorogo is a noble heritage, where the origin of this dance from Ponorogo, East Java Province. Where In staging this Reog dance is divided into several sessions. And the Reog dance, is one hallmark of Indonesia wherever located. If you want to watch, staging the biggest reog, go to ponorogo. And the staging event is only once a year, and the staging is usually followed from the various regions, and provinces in Indonesia. And precisely for this performance, in suro in Javanese calendar. And even this reog, also remain preserved wherever it is, any native son ponorogo, there is almost no associations reog ponorogo preserve it, without losing the original dance reog ponorogo. Almost every region in Indonesia was the son of the origin ponorogo, usually Formatting associations, and usually perkumpulannya was named pawargo. Hopefully a little about reog ponorogo can add insight, for my personal blogger friends and generally for all.